This is a Raspberry Pi outfitted in a DSLR battery grip. [Dave H] was very interested in the idea of combining a single-board computer with a high-end camera. The size and cost of such a computer was prohibitive until the RPi came along. He managed to fit the board into the broken battery grip he had on hand, and he already has the prototype up and running. 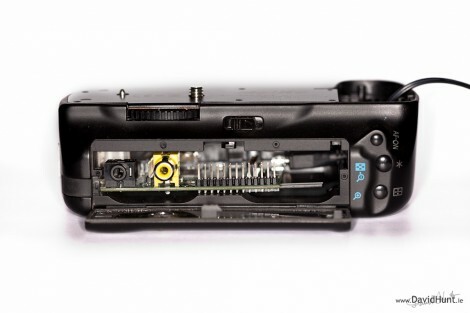 [Dave’s] alterations to the battery grip allow access to the USB, Ethernet, and Composite video ports. Powering the RPi was a bit of a challenge. He tried using an iPhone charger with four AA batteries but that only provided 4.2V. After going back to the drawing board he discovered he could rework the parts that he removed from the grip, using a Cannon 7.2V 1800 mAh battery. So far he can automatically pull images from the Camera and transmit them over a network connection. But since the RPi is running Linux, there’s a whole world of hacks just waiting to be exploited. What comes to mind first is image manipulation software (like ImageMagick) which has a command-line interface. I guess I am missing the point. Between an eye-fi card and installing the magiclantern firmware it seems pretty much all his features are covered. I also thought: what’s the point? But he explains a few uses that might make the idea a cool thing. However, he could just plug in a eye-fi and do it with a remote Raspberry or PC. Putting it in the grip doesn’t really add that much. But nice work, no question! I can see this being a flexible solution, ie do what you want how you want multiple backups alsorts of stuff…. I’d be very interested to know what practical (run time) usage you get out of the battery.. The sweetest RasPi hack I’ve seen so far. And let’s not overlook the irone that he was able to use an oddly shaped container for a system board that is not straight forward to put in a box (no screw holes). This offers a lot more storage capabilities over an eye-fi: you can plug in cheap lightweight flash disks on the usb and sync. Don’t forget that photographers, even amateurs, drag along a lot of equipment and their storage cards are not the cheapest. With an eye-fi you need to carry extra equipment its power supply and charger. I love this idea for its ability to control more than just the camera, which a Eyefi card can’t even dream of. Not only can the camera be controlled via its hacked firmware and usb port, but the Pi could easily interface with a motorized pan/tilt tripod head, and maybe a motor on the zoom lens as well, like a poor man’s gigapixel setup. For astrophotography, the Pi would talk to a GPS receiver or two, and control a telescope mount, dew heater, etc, blow away a Meade or Celestron controller that costs 10x as much. Great ideas man. I am already getting excited by the DSLR possibilities. Also remember you can set it to recognize a face and start recording if you positioned the camera covertly. There is already great code out there for this. My last employer used to shoot Realestate photography for agents, and the photography team would have given their left arm for this. For high shots at present they need to send the camera up a pole with a 15m cable running back down to a laptop making it awkward and hard to move around during a shoot when working alone. A little mencoder or ffmpeg love could make ready made timelapse preview. Neat.